A novel route for obtaining iridium-based electrocatalysts supported on sub-stoichiometric titanium oxides for catalytic applications is presented. 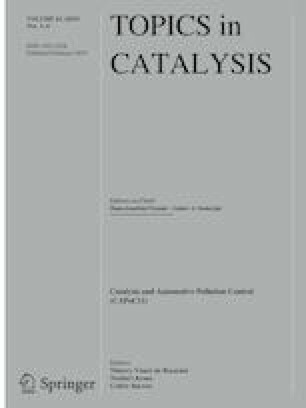 Chloride-free titanium oxide nanoparticles have been produced in a H2/O2-flame reactor using titanium (IV) tetraisopropoxide as precursor material. Fuel rich combustion leads to the formation of sub-stoichiometric titania (TiO2−x) with an increased number of oxygen vacancies and enhanced electrical conductivity. Subsequently, TiO2−x was dispersed in 2-propanol and spray coated on titanium substrate under argon atmosphere, forming a titania layer. This multilayered support system was decorated with iridium nanoparticles from an iridium-based electrolyte, applying an electrochemical method. This deposition technique leads to an optimized allocation of the electrocatalyst particles, adequate adhesion to the support and, furthermore, ensures the electrical conductivity from the deposited Ir particles via the TiO2−x coating towards the titanium substrate. Finally, this process generated electrochemically active electrodes for the oxygen evolution reaction (OER) in acidic environment. The mean crystallite size of the iridium catalyst was determined from the X-ray diffraction patterns according to the Debye–Scherrer equation to be 11.4 nm. Linear and cyclic voltammetry were performed in 0.5 M H2SO4 on the iridium/titania/titanium samples and proved the electrochemical activity of the prepared system. The increased catalytic activity of the prepared iridium samples was indicated by a decrease of the Tafel slope for the Ti-PTL/TiO2−x/Ir in comparison to electrochemically oxidized iridium sample. At higher overpotentials, the calculated Tafel slopes (112 mV dec−1) present greater values than commonly reported Tafel slopes for IrO2 based electrodes, revealing a different rate determining step for the OER. The present work has been carried out under the scope of the project “Entwicklung von kostengünstigen und nachhaltigen Elektrodensystemen auf Basis von optimierten Iridium/Titanoxid-Schichten für den Einsatz in der PEM-Wasserelektrolyse”. The IGF project (19817 N) of the research association (Umwelttechnik) was approved by the AiF within the framework of the program for the promotion of industrial community research and development (IGF) by the Federal Ministry of Economics and Technology Funded by the German Bundestag. Furthermore, we thank GKN Sinter Metals Filters GmbH, Germany, for manufacturing the Ti-based electrode structures, which were used as support material for our study and RUBION Center from Ruhr-University Bochum for accomplishing the XPS Analyses.